Ss Peter and Paul Church is located in central PA approximately 1 hour north of Harrisburg, and 1 hour south of Wilkes-Barre. Take Minersville exit 116 to Rt 901 and travel 5 miles. The Church is on Route 901, 1/2 block from the second traffic light, on the left. 8:45 AM Divine Liturgy or Obednitsa. 8:30 AM Divine Liturgy or Obednitsa. 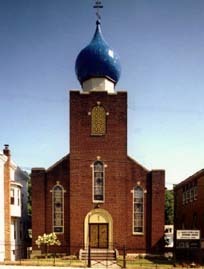 In the year 1910 a small group of people in Minersville, Pennsylvania and vicinity saw the need for establishing a church of the Orthodox faith. They met in a private home in Forestville and organized a fraternal society under the patronage of St. Stephen. At the same time, they also chartered the parish of SS. Peter and Paul. Charter members were: John Nicholaevich, President; Trifon Wyslotsky, John Oakill, Alexander Demsko, Simon Kurilla, Tomko Shoppa, Aleksi Wyslotsky, John Zubkevich, John Barsch, Dimitri Molodchak and Harry Sidoriak. At this same time, they also chartered the parish of SS. Peter and Paul. The purpose of the corporation to be the support of public worship of Almighty God according to the faith, doctrine, discipline and usage of the Russian Orthodox Greek Catholic Church. Charter members were: John Nicholaevich, President; Trifon Wyslotsky, John Oakill, Alexander Demsko, Simon Kurilla, Tomko Shoppa, Aleksi Wyslotsky, John Zubkevich, John Barsch, Dimitri Molodchak and Harry Sidoriak. The first task to confront the founders was finding a house of worship. They purchased a hall on Third Street and also a plot of ground in Llewellyn for a cemetery. The parish was serviced by a priest from St. Clair until 1912. In 1913, the temporary church on Third Street was sold and the present location on Sunbury Street purchased for $10,000. There were two small homes on the property, one was razed to make way for the church and the other was used as a rectory—the basement of which was used for church services until early in 1914. Construction began on the basement of the new church by Alex Shylack and was completed by December. The basement was then used for services for 23 years. In 1920 the second old building was razed and the present rectory built at the cost of $6,090.00. Construction began on the present church in August, 1937, and by December it was completed. The building is constructed of steel frame, concrete block and faced brick. It is 84 feet long and 40 feet wide. From the basement to the top of the cross it is 77 feet high. The stainless steel cross on top of the cupola is six feet high. The architect who designed the new church was George Chronuak, associated with Wenner & Fink, Philadelphia. The general contractor was F.C. Kuick, Pottsville. On January 1, 1938 the first service was held. The church was blessed by the Very Rev. Basil Repella, pastor, and neighboring priests. Labor Day of that same year the Cornerstone was dedicated. Divine Liturgy was celebrated and the new church was blessed by His Eminence, Archbishop Arseny assisted by twelve priests and an archdeacon. St. Ann’s Altar Society was established for the purpose of upkeeping the church and rectory and forming fund-raising dinners for the church. They purchased new carpets for the Sanctuary and church aisle. For Easter, a new altar table, table of oblation, gospel reading stand and center table were acquired from Conrad & Sons, Port Carbon. Anniversary of the founding of the parish. 1941 marked the year an iron fence and arch at the entrance of the parish cemetery were installed. The iconostas was built in 1942, and beautiful new icons were placed on the walls. A listing of the original donors can be found in this book. Because good things take time, every year something was either added to or improved in the parish. In 1944 the church interior was painted and designs decorated the wall. The iconostas was gilded in gold-leaf by Nicholas Bervinchak, a well-known artist in Minersville. The copper covered cupola was also built by F. C. Kuick in Pottsville. A 1,200 lb. bell was purchased and blessed by the pastor and priests of the district and dedicated in the name of St. Basil the Great in 1949. On September 4, 1950, the church was formally consecrated by His Grace, Bishop Nikon, who placed a Holy Relic in the Altar. This was the 40th Anniversary of the founding of the parish. A banquet was held and the burning of the mortgage was witnessed. Between the years 1950-1959 many necessary articles were purchased or donated to the parish. These included four brass candelabra and a gold chalice set. A furnace was purchased and installed where the past kitchen used to be and a kitchen was made where the altar used to be when services were held in the basement. Carpeting for the churchÃÂ­s center aisle was donated by St. Ann’s Altar Society. A new plaster ceiling was built in the church and the interior washed, painted and redecorated again by Nicholas Bervinchak. During this time new solid oak pews from Wisconsin were added. A sister church, St. MichaelÃÂ­s in Buck Run, operated until the early 1960s when, due to the lack of employment in the coal region, attendance declined and its maintenance became a financial burden. The building was sold to the Foster Township supervisors to be used only as a township meeting building. Everything in St. MichaelÃÂ­s Church was removed and delivered to St. TikhonÃÂ­s Monastery to be donated to other parishes or disposed of in a proper manner. The years 1970-1979 saw additional upgrades to the church and rectory interiors. All stained glass windows were removed, repaired and replaced and new stained glass doors were installed on the front of the church donated by St. Ann’s Altar Society. The iconostas was completely refurbished and the church interior renovated in 1975, by B.K. Bennington and Son, Scranton, PA to prepare for the 65th Anniversary of the founding of the parish. Also, around this time the wooden cross in the cemetery was sided with white aluminum and additional land was purchased. This land was from where the cross stands to where the present day road is at the bottom of the hill. This could not be purchased earlier due to a coal breaker on the property. In 1979, the Federated Russian Orthodox Club, Chapter 34, celebrated their 50th Anniversary. The F.R.O.C. Club was originally chartered in 1929 and rechartered in the early 1970s. The 1980s was a momentous decade for our parish. In 1980, on the tenth anniversary of his ordination, our pastor, Fr. Michael Hatrak, was awarded the Gold Cross. In 1985, Fr. Michael was awarded the title of Very Reverend. In 1983, Ronald Wyslutsky, son of Nicholas and Anna Wyslutsky, became our first parishioner to enter the seminary. In 1988, Gregory Hatrak, son or Fr. Michael and Matushka, also entered St. Tikhon’s Seminary. Upgrades to the church included a new plaster ceiling, exterior painting and the cupola repaired and painted. The interior was cleaned, repainted and side walls marbleized. The 75th Anniversary of the founding of the parish was celebrated on September 8, 1985. The decade of 1990-1999 was a very busy time for our parish. An illuminated sign was purchased and placed in the front yard of the church. In August 1990, our exquisite chandelier was removed, completely refurbished and returned in April of 1991. In 1993, a new granite cross for the cemetery was erected and dedicated replacing the original wooden one. The costs of the new cross and chandelier were donated by our parishioners and friends. Plaques acknowledging these donations are displayed in the church. Improvements to the rectory during the 1990s included a new furnace, wallpaper, carpeting, kitchen and bathroom and kitchen renovations. In 1995, a new church roof was installed. In 1997, the restrooms were completely renovated. A railing was installed along the sidewalk of the church, donated by Mr. and Mrs. John Barnetsky. In 1999, the exterior church foundation and windows were painted; a security system was installed in the church and rectory. Our parish family has experienced numerous theological accomplishments. In 1994, Fr. Deacon Nicholas (Ronald) Wyslutsky was ordained a priest in our church. Fr. Nicholas served Holy Ascension Orthodox Church, Lykens, PA, All Saints Orthodox Church in Olyphant, PA and is currently the pastor of St. Nicholas Orthodox Church in Mogadore, Ohio. He has been awarded the title of Very Reverend. Also, in 1994, Gregory Hatrak graduated from seminary. In 1995, a Hierarchical Divine Liturgy was celebrated by His Eminence, Archbishop Herman, on the occasion of Fr. MichaelÃÂ­s twenty-fifth anniversary of his ordination at which time he was awarded the Jeweled Cross. At a dinner hosted by the parish, Fr. Michael was presented with a jeweled cross as a gift from the parish. Religious awards in Scouting were earned. As Girl Scouts in 1989, Nicole Stablum and Natalie Hatrak received the Chi Rho Award. Richard Hutton, Jr. and Christian Pascuzzo received their Chi Rho as Cub Scouts in 1999. Richard went on in Boy Scouts to earn Eagle Rank. His Court of Honor ceremony to receive this highly regarded accomplishment was held in our church on September 24, 2006. In October, 2007 Natalie Hatrak was among a group of seven who were the first to be presented the Orthodox Church in America Saint Peter the Aleut Youth Service Award for completing 25 hours of service outside their parish communities by offering their time and talents in various ministries. Fr. Michael and Matushka were honored in June, 2004, with the Order of St. Innocent, Enlightener and Apostle to America, Bronze Award, bestowed in recognition of many years of devoted service to St. Tikhon of Zadonsk Monastery and St. Tikhon’s Orthodox Theological Seminary and with gratitude for their commitment to the life and mission of the Orthodox Church in America. Our 90th Anniversary of the founding of our parish was celebrated on September 24, 2000, the year of the new millennium. Our preparations included painting the church basement, installing new ceiling tiles and purchasing new chairs. We have hosted numerous liturgical services, mission services and lectures for our spiritual benefit, most notably, a visit of the Miracle Working Icon “She Who is Quick to Hear” from St. Tikhon’s Monastery on Tuesday, December 9, 2008. We prayerfully invoked her intercessions through an Akathist composed especially for those suffering from various cancers. An ambitious restoration project was planned in anticipation of this 100th Anniversary of the founding of our parish as we were challenged once again to maintain the beauty of our holy temple. In addition to the church interior being washed and painted; chalices, a gospel, a hand cross, candle and votive stands were restored, three pews refinished and new table covers sewn through the generous donations of parishioners and friends. Also, the church fence is now a thing of beauty. The contributors are recognized for their dedication, love and support in the booklet prepared for the Anniversary celebration. The 100th Anniversary celebration was held on Sunday, September 26, 2010. His Grace, Bishop Tikhon, celebrated the Hierarchical Divine Liturgy assisted by Archpriest Michael Hatrak, pastor; Archpriest Nicholas Wyslutsky, son of the parish; 12 deanery and visiting clergy; Protodeacons Stephen Howanetz and Sergius Kapral and Subdeacons Gregory Hatrak, Abraham Labrada-Santiago and Joshua Smith. We were honored to witness the ordination of Reader Gregory Hatrak, son of Archpriest Michael and Valeria Hatrak, to the Holy Diaconate during the Divine Liturgy. The Church received a Synodal gramota to commemorate the 100th Anniversary and also Fr. Michael Hatrak’s 40th anniversary of his priest ordination. Diocesan gramotas were given to JoAnn Brinich, Elsie Herman, Timothy David Studlack, and Matushka Valeria Hatrak for their love, devotion and support of the Church. A festive Centennial Banquet was held in the afternoon. In our 100th year St. Peter and Paul’s with great humility in our hearts and souls is thankful to Almighty God as we reflect on the past and look forward to the future. We have continued our ancestors’ labor of love for the worship of Our Lord Jesus Christ. We pray that the seeds of Orthodoxy they planted in Minersville all those years ago will remain to grow and prosper.